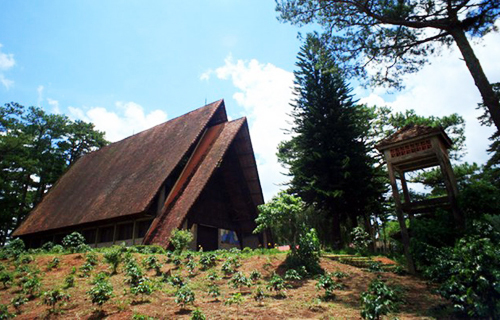 The church of Cam Ly or Son Cuoc Church, located on a hill near Cam Ly Waterfall in Da Lat City, is the reserved shrine for the local ethnic communities. 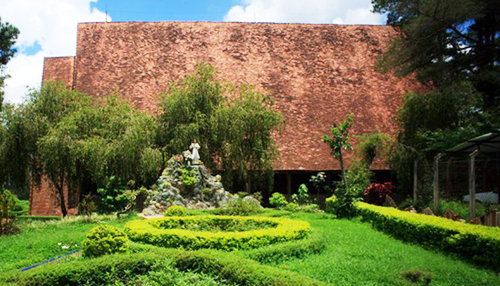 The church was constructed by Father Boutary, a French Priest and Evangelist, and the contractor Nguyen Thanh Ho. The construction began in 1960 and was completely accomplished in 1968. 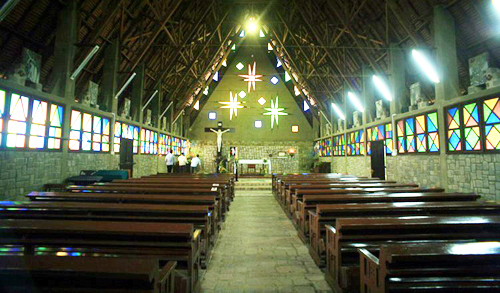 With the chief visitors from ethnic minorities, the architecture of Cam Ly Church is strikingly different from that of common Kinh people's churches. 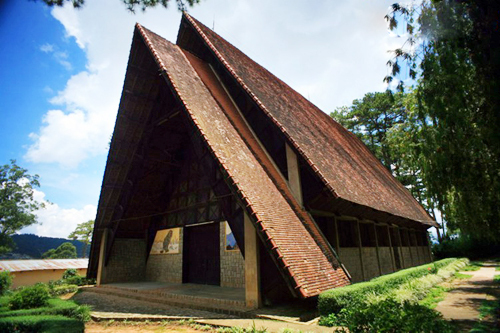 The church architecture is a successful stylization of the characteristic Communal House (Nha Rong) of the Vietnamese Central Highlands, basing on the quintessence of Brutalism (a style of architecture used especially in the 1950s and 60s which uses large concrete blocks, steel, etc. ), which creates the perfect harmony of Western and Eastern architectures. 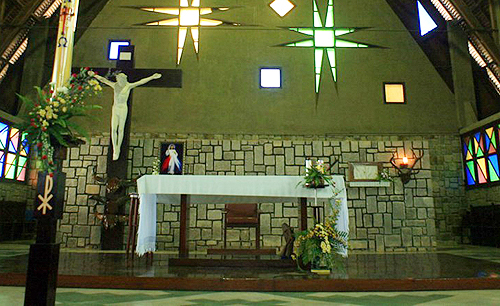 The church premises are a 324-square-meter rectangle, one third of which is the church hall and the rest of two thirds is for accommodating the faithful. Looking frontally, the over-17-meter roof is the perfect reminder of a giant arrow stretching to the sky while the right and left sides look greatly like the two gigantic axe blades. The rudimentary weapons of arrows and axes have long been the effective fellows of local ethnic people there. The main load-bearing structure is a reinforced concrete frame covered with stone walls of 40 centimeters in depth and 2 meters in height. All the paths inside and around the church are paved with cleaved stones. Several 300 x20 x 50-centimeter wooden columns are tightly tied together to form the extremely firm pillar system. 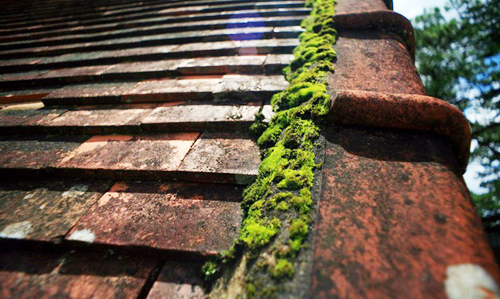 More than 80,000 roof tiles with the hook at the edge to thread zinc wire through to connect with the roof batten were used to cover the whole roof of steep slope. 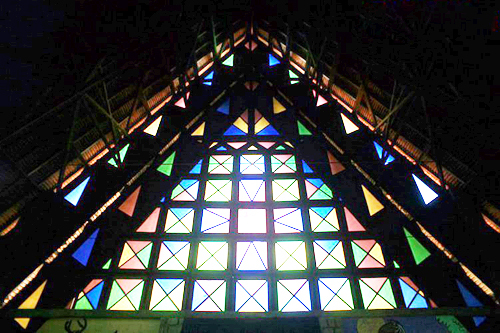 The inside decoration is also appreciated highly thank to the miraculous lightening space from various stained glass windows with specific ethnic patterns in triangle and square shapes. To ethnic communities along Vietnamese Central Highlands, the triangle represents for the fabulous preeminence and power of God while the square is the symbol of Earth surrounded by planets of Venus, Mars, Jupiter and the Sun. 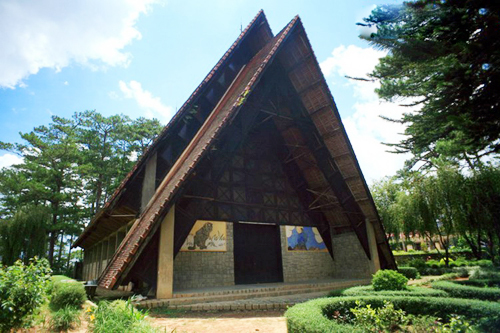 Located at the upper side of the holy shrine is a 3.9 x 0.9 meter altar of old pine wood from Lang Biang Peak which had been dried for over 15 years before the construction of the church. Beneath the Holy Cross lie three buffalo horns – the important animal for those ethnic people in both daily manufacture and worships. Right at the middle of the anteroom is two statues of a tiger (representing power and strength) and a phoenix (the symbol of erudition). These two sacred creatures also represent a religious belief: The primitive men used to live wildly as tigers but they were getting wiser and wiser as phoenixes thank to the God's enlightenment. 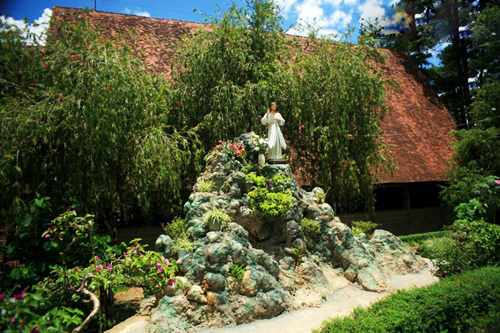 Surrounding the church of Cam Ly is a beautiful garden of plentiful types of pretty flowers, contributing to highlight the perfection of this matchless architecture.